A good day out doesn't have to cost anything! Here are 45 free activities on the Isle of Wight. You might also like to see our guides to days out for teenagers, toddlers and families and rainy days out on the Isle of Wight. Or perhaps you're a fellow bargain hunter - if so, check out our guides to discount Isle of Wight ferry travel, holiday parks, cheap places to stay and eating out on a budget. Let's start with the most obvious free entertainment on the Isle of Wight - miles and miles of beautiful beaches. The Isle of Wight's coast is a compact version of the mainland, with mini versions of many of the UK's most popular beaches. If Blackpool-style buckets and spades are your thing, Sandown or Shanklin are your best bet. 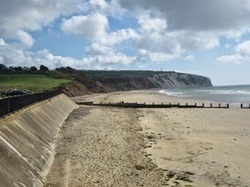 If you fancy cliffs and watersports try Hanover Point (surfing and bodyboarding) or Brook Chine (kitesurfing and windsurfing). For a Cornish style fishing bay, try Steephill Cove. For something akin to the wide open beaches of Lincolnshire, try kite flying or ball games at Appley at low tide. If you fancy a bit of rockpooling try Bembridge beach. On a very sunny day you might even convince yourself that Priory Bay (near Seagrove Bay) or Whitecliff Bay resemble a foreign island with their lush sands and tree lined backdrop. See our guide to 'Which is the best Isle of Wight beach for...' or the Beaches Map. A couple of years ago the beaches with blue flags for clean water were Sandown, Ventnor, Yaverland and Colwell (after that the Isle of Wight Council stopped paying for the flags, but presumably the water is still the same). Or what about watching the sunset? Oh come on, where's your sense of romance? The sun setting at Compton Bay (or Gurnard is nice), the waves lapping on the shore, a guitar strumming Wonderwall, sharing a glass of tap water with a loved one (this is a free guide remember). I would recommend falling asleep on the beach with the stars as your canvas but a) it's not all that wise b) it would sound silly. 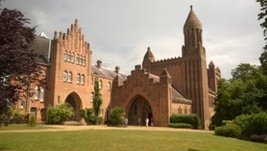 Quarr Abbey is a working Benedictine monastery near to the Fishbourne ferry port, which welcomes visitors of all ages. ​There's a nice coffee shop which offers cream teas and they sometimes run free tours of the grounds (donations welcome). There are also some pigs which you can feed with food bought from the Abbey and there's a woodland trail which took us about 30 minutes with an off-road pushchair. Parking is free as well - all in all, a great value outing. The current Abbey is early 20th century, but there is a ruin of the original 12th century monastery. Everyone knows that attempting I-Spy in a car without a book or some other list makes a short journey feel like an everlasting journey. 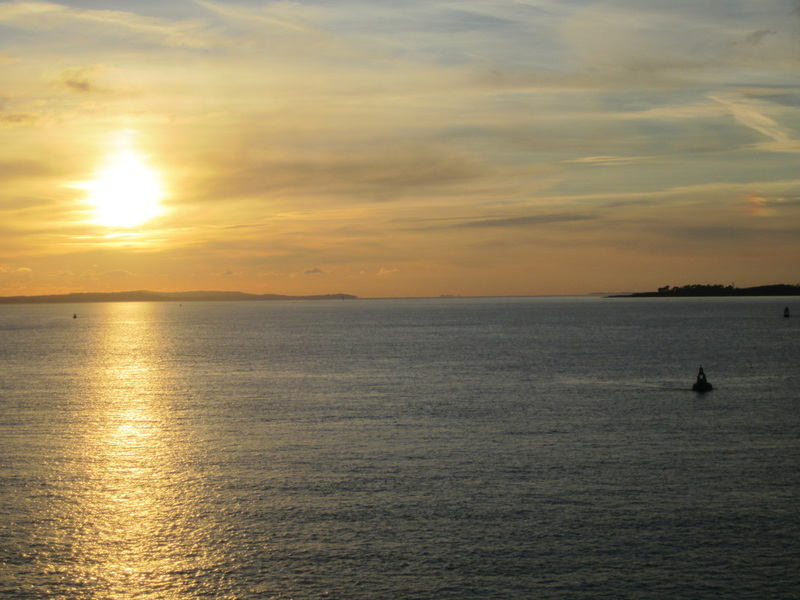 One free option is Isle Spy, which is Isle of Wight Guru's free car journey game. Alternatively, you could buy the original I-Spy Isle of Wight game for around £2. OK, OK, I know that isn't technically a free activity but it's not bad for a week long activity or you could get it from a library. There are also similar books for travelling on a ferry or being at the seaside, but the Isle of Wight one is the most fun. Warning: don't suggest this game to teenagers. 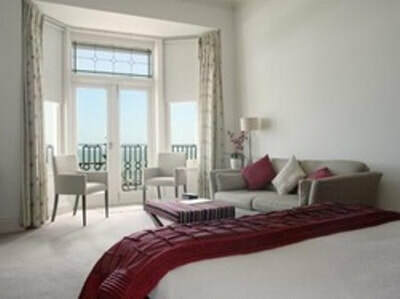 Have you seen our guide to 10 of the best...places to stay in Shanklin? 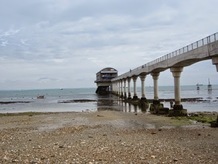 Bembridge Lifeboat Station is a great little trip out. RNLI class it as one of its 'discover' stations. Not only are they good enough to save people's lives, they also have volunteers giving free tours! There's an impressive walkway/pier, although keep hold of little toddlers as there are some gaps along the edge. ​Whilst you are in Bembridge, you might like to try out the country's oldest working telephone box (read about our attempt to use the Bembridge phonebox). Another option is to visit the RNLI Inshore Lifeboat Centre in East Cowes, where about half of the RNLI's fleet is built and repaired. They offer free tours, though you have to book in advance. Many thanks to Roger for letting us know about this gem. ‘St Catherine’s Oratory’ (or the Pepperpot) may look like a poor attempt at rocket building but it's actually a former lighthouse. A local Lord decided to tuck into some shipwrecked communion wine, which didn't go down well with the Vatican. He was told to build the lighthouse as penance in 1313AD. Strangely though, it's not actually all that near the sea, and it was eventually replaced by St. Catherine's Lighthouse which is still operational (also very interesting, though it isn't free). 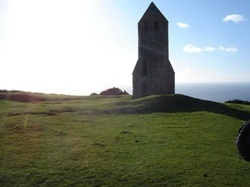 Spotting the Pepperpot is not all that easy considering that it was built to be seen. When we've visited it we've parked at the viewpoint car park on Blackgang Road (nearest postcode PO38 2HN) and walked about 1/2 a mile up a steep hill. The Isle of Wight's wine region is second only to France's, and perhaps that of Spain, Chile, Portugal, Australia, Italy, South Africa, Germany, Argentina, Mexico, and Uzbekistan. OK, so perhaps the Isle of Wight isn't famous for wine. 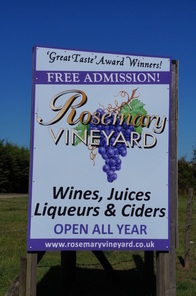 However, there is Rosemary Vineyard (read the reviews) which you can visit for free. There is another vineyard (Adgestone) but you have to pay for that one. 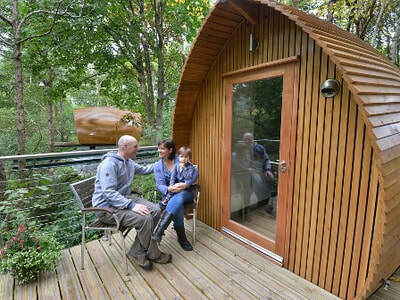 Or perhaps The Garlic Farm(read the reviews) which is free with a small children's playground, garlic tasting and a woodland walk. There's also a large garlic-themed shop and a popular cafe/restaurant. For a couple of pounds you can have a 20 minute farm tour in a trailer pulled by a tractor. Needless to say, these places all have plenty of ways for you to spend your money if you want to! 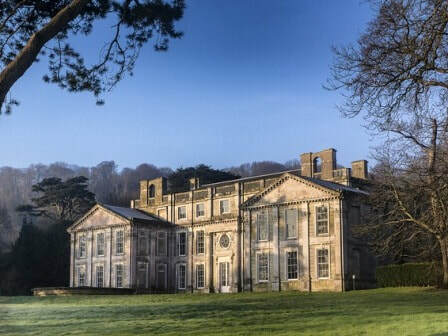 Appuldurcombe Manor looks very grand from the outside but if you peek inside you'll notice it's a ruin. It's an 18th century building with grounds landscaped by Capability Brown. It is owned by English Heritage, but is currently free to visit, regardless of whether you have membership or not. ​There isn't loads to do, but it's nice for a short wander round. 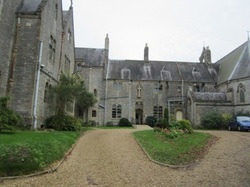 This former nunnery is now a Christian House of Prayer and Healing (PO30 1YS) which is open to the public for cream teas and general wandering around (contact them to check times as it's largely run by volunteers). It's a fascinating old building with an attractive garden, courtyard and chapel and has lots of signs of its former life. 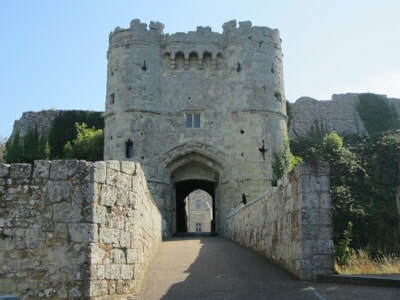 It's also very near Carisbrooke Castle, so you may want to combine the two visits. Have you seen out guide to 10 of the best places for large groups to stay? It is a scientifically proven fact that history only becomes interesting once you are old enough to have children, by which stage your children make a fuss when you want to visit anything historical. 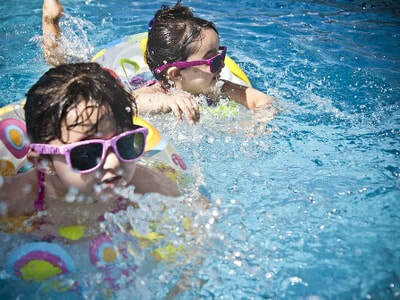 ​This leads to an intergenerational squabble on family holidays, which can only be solved by following the system of each family member choosing the activities for one day. Anyway, there are many historic churches on the Isle of Wight which are worth a visit. St Boniface's 'Old Church' in Bonchurch lives up to its name as it is mentioned in The Domesday Book. All Saint's Church in Freshwater is known to date from the 11th century or earlier, whilst the town's St. Agnes Church is the only thatched church on the Island. St. Lawrence Old Church on Seven Sisters Road is a cute little church with a door so low that you have to duck. It's at least 800 years old and includes work by pre-Raphaelite artists. 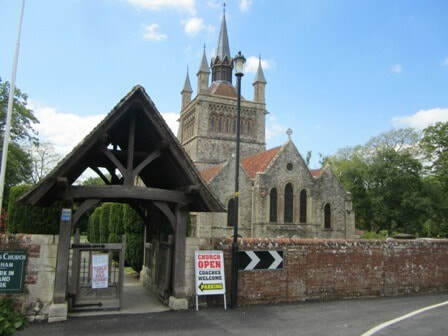 St Mildred's in Whippingham has all kinds of Victorian royal connections thanks to its proximity to Osborne House. All Saint's in Godshill is exceedingly quaint and is featured on postcards and boxes of fudges in all gift shops. Have you seen our guide to the cheapest Isle of Wight accommodation? There are two National Trust attractions at the Needles - one is free, whereas the other isn't. The exhibition at the Needles New Battery is the free bit, which tells the bizarre story of the time that the Isle of Wight took on the USA and the USSR in the space race. For 15 years, up to 240 people worked in underground bunkers at the Needles headland on the Black Knight. Apparently locals had no idea what was going on, although they must have thought it a bit strange when so many people kept turning up for work at a lighthouse. The Old Battery, which is a Victorian fort, is the bit you have to pay for, although it is free for National Trust members. Perhaps a little obvious, but there are 500 miles of public rights of way on the Isle of Wight, including some stunning coastal paths. Free walking routes include those offered by Red Funnel, Wightlink, Visit Isle of Wight, National Trust and there are organised walks by the Isle of Wight Ramblers. Or you can buy a book of course. There is even an Isle of Wight Walking Festival in May - see our guide to major events on the Isle of Wight for more information. We enjoy esplanade walks, such as Gurnard to Cowes, Bonchurch to Ventnor or Yaverland to Shanklin. The video below does a terrific job of showing off some of the West Wight's coastal path. A few years ago there was a live BBC series which involved digging up the Isle of Wight to look for dinosaur bones. There was an entertaining review of it on the BBC website (which has since been removed) which includes quotes from the presenters such as 'Wobbly wobbly wobbly goes the screen, wah, wah, wah'. Anyway, I digress. Many of the world's finest dinosaur exhibits came from the Isle of Wight and now live in museums. According to this guide from Red Funnel you might just stumble across a priceless fossil at Bembridge, Blackgang Chine (possibly fibreglass), Brighstone Bay, Brook Bay, Culver Cliff, Gurnard Bay, Hamstead, Rocken End, Shepherds Chine, Thorness Bay, Whitecliff Bay, Yarmouth, Yaverland and just outside Poundland in Newport High Street. For the curious, there are some fantastically titled books out there with names like 'Baryonyx and Other Dinosaurs of the Isle of Wight' and 'The Ornithischian Dinosaur Hypsilophodon from the Wealden of the Isle of Wight'. If the phrase 'Bristol K5G 721 (EDL 657)' makes your heart beat a little faster then you will enjoy the free Isle of Wight Bus and Coach Museum. There's a place to buy a cup of tea and there's also a shop. It is run by an 'enthusiastic group of volunteers and is only open certain days, so check their website. It is near Ryde at PO33 2BE. 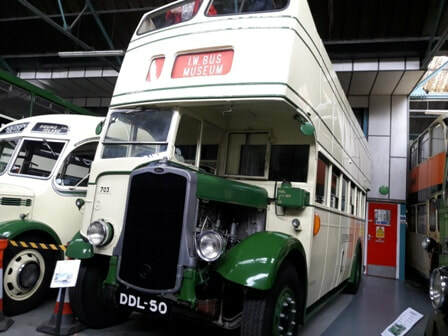 Read our blog about a rainy day trip to the bus museum. We don't generally include events in this free days out guide, but if you are on the Isle of Wight in early August, ﻿Cowes Week﻿ is worth a visit, even if you don't sail. The town is crammed full of people and there are usually corporate stalls along the esplanade selling cheap copies of the Daily Telegraph. If you want to blend in, wear red trousers and deck shoes and turn your collar up. Legend has it that the southern tip of the Island rises by six feet on a Friday night in August because the whole island has travelled north to watch the free fireworks display. It's been troubled by funding problems in recent years, so they are always on the lookout for donations. See our guide to festivals and carnivals on the Isle of Wight. For those who like things on the artsy fartsy side of life, the Quay Arts centre regularly offer free exhibitions to thoughtfully stare at. Please avoid making unhelpful remarks such as "I could have done that". Some of the parades are illuminated, some are 'children's carnivals' and some are just your bog-standard selection of people wearing silly costumes. I'm not an expert on the carnival scene but there are carnivals in Sandown, Shanklin, Ryde, Newport, Ventnor, Cowes, Yarmouth and St Helen's. I've not been to all of them, but I get the impression that the biggest carnival on the Isle of Wight is Ryde and that Sandown is also pretty big. Apparently Ryde is the UK's oldest too. If you're a carnival expert (a carnivore?) and can correct me, please contact us. This one is more of a night out than a day out. The Isle of Wight is pretty decent for stargazing in places, thanks to its lack of light pollution in some areas. The West Coast is generally your best bet as there are fewer towns around to interfere. After a few minutes Googling, I've concluded that the best sites are Atherfield, Compton, Newchurch, The Needles and St Catherine's Down. You're welcome. Above: One of many good stargazing spots - this one is near Atherfield, which is suggested by The Guardian. 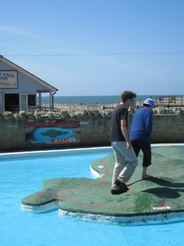 Perhaps not a whole day out but Ventnor's paddling pool is good fun in the summer for toddlers. It has a map of the Isle of Wight you can walk all over, which leads to conversations such as "Oooh look, I'm treading on our house" and "What are you doing in Portsmouth, it's much prettier over here?" There's a nice cafe nearby and a water feature for parents to admire. Ryde's paddling pool near the Appley seafront is more modern with things which spurt and squirt. There's also a paddling pool on the Esplanade at East Cowes. 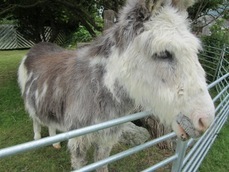 See our guide to days out for toddlers on the Isle of Wight for more of this kind of thing. I wasn't an expert on playgrounds when I started this site, so I consulted Granny Guru (TM) who wrote our guide to activities to do with toddlers on the Isle of Wight. Granny Guru's favourite outdoor playground is in Sandham Grounds in Sandown (PO36 8AS - near Dinosaur Isle) and it might even satisfy some teenagers as well, as it's got a fair few facilities including a skate park (see our guide to activities for teenagers). It's also got a pond with ducks and swans (assuming they turn up). The nearby Clubhouse cafe in Brown's Golf Course is toddler friendly. If you fancy a seaview whilst you watch the little ones fighting over see-saw then you might like Appley (PO33 1ND) which has a playground on the beach and another on the esplanade. 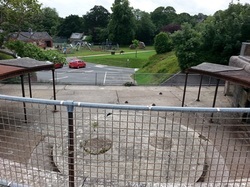 Nearby Puckpool Park has plenty of play equipment too. There's a good sea view from the Gurnard sea themed playground (see slideshow above, PO31 8LE) and from East Cowes large but occasionally smelly playground (PO32 6AE). Ventnor's Seabreeze playground has perhaps the best sea view of any playground on the Island (PO38 1EH). See the toddlers guide for more playground related advice. Another one I've not been to yet is Cowes Maritime Museum which is within Cowes Library and includes a dinghy belonging to Uffa Fox. The chance to show off your sweaty weightlifting body used to be reserved for those willing to pay £40 a month for gym membership. Not any more! 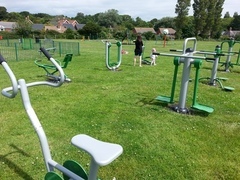 Outdoor gyms are appearing all over, and the Isle of Wight is no exception. Locations that we know of include an Olympic themed one at Sandown/Yaverland within Sandham Grounds (PO36 8AS), Ventnor Park (PO38 1LB), Northwood Recreation Ground and Freshwater's Stroud Recreation Ground (PO40 9AX). Thanks to Karen for getting in touch and recommending Ventnor Park, which I must admit had slipped my mind. It's got a bandstand which was apparently rescued from the old Ventnor Pier, although it looks like they borrowed it from In The Night Garden. The bandstand has regular performances and the park also has an outdoor gym (see above) as well as a putting green and cafe. It won a Park of the Year Award in 2016 which isn't to be sneezed at (unless all the flowers give you hayfever). Not far from Ventnor Park is the Diplodocus Labyrinth which can be found painted onto grass near the La Falaise car park (PO38 1JY). It was created by the Ventnor Enhancement Fund and is a bit like a maze, but with fewer decisions to make, which is ideal for indecisive visitors. Ventnor Park...or is it the Night Garden? The Longstone is two great big lumps of greensand sandstone which sit in a field in the West Wight (nearest postcode PO30 4EA). The National Trust look after it (I'm not exactly sure how much 'looking after' a stone needs, but still...). There is more about its history in our guide to 25 historic days out. If you can't be bothered with reading all that, the short version is that it marks a 6000 year old burial ground and it's about 4 metres tall. Not quite Stonehenge, but still an interesting rock if you're passing. Above: The location of the Longstone, which is not far from Strawberry Lane. 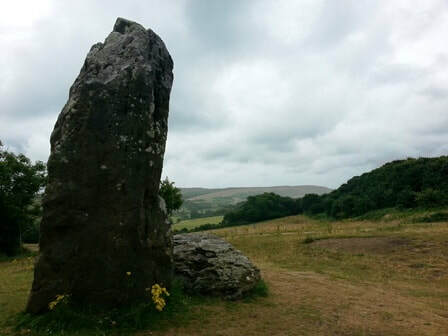 Read about my soggy visit to the Longstone (or don't, it's really up to you). The Devil's Chimney is certainly not a whole day out, but it's worth a quick visit if you are in the area anyway. It's essentially a big crack in the rock which you can walk through (watch the video - not my work). You'll find it on the route between Shanklin and Ventnor. According to Wikipedia, 'its upper end is at the Smuggler's Haven Tearooms' (PO38 1QD). This free museum (PO31 7AJ) is in the centre of Cowes (in the High Street). It was the home of Sir Max Aitken who was (according to the website) 'a newspaper magnate, a fighter pilot in WWII, a Conservative MP, a racing yachtsman, a powerboat pioneer and the London Boat Show founder'. Highlights include marine paintings, Giles cartoons and a cradle made for the infant King of Rome, son of Napoleon Bonaparte. I think my mum's got one of those in her attic. My employers once tried to make me go on a ghost walk as a 'team social'. I made my excuses and went to watch football at the pub, which may give you a hint as to my enthusiasm for such things. However, I do appreciate that lots of people enjoy Ghost Walks, even if you just want a quirky approach to local history. You can take yourself round The Old Cowes Ghost Trail for free. 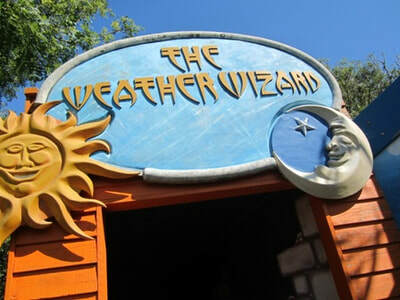 It's provided by the Isle of Wight Ghost Experience, who also do paid for trips. I'm still looking for a guide to the Olde Ventnor Unicorn Trail or the Olde Shanklin Leprachaun Trail. I was in two minds as to whether I should include a shop as a 'free day out' but Jurassic Jim's in Shanklin consistently gets rave reviews, and there's nothing to stop you just going inside for a nosey. Most of the fossils and stones were dug up by the owner and some are sold for as little as £1, which I would call pocket-money prices. Well, my pocket money was 10p a week so I'd have had to save up for more than two months, but that doesn't take inflation into account (and my tough upbringing). 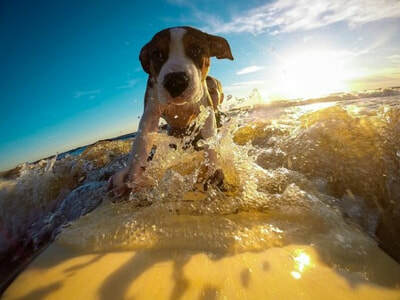 Some beaches are excellent spots for kite flying, although do try to avoid landing your kite on any sunbathers if you can. 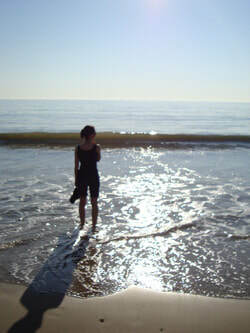 It can be particularly good fun on a sunny winter's day when the beaches are quieter. You'll obviously need to check tide times, but Yaverland Beach (near Sandown) is a good spot for kite flying. Appley Beach at Ryde is another wide open beach with space to run around screaming. ​We also had an hilarious attempt at kite flying at Compton Bay (near Brook and Brighstone) which ended when the kite crashed into the cliff and snapped in half (see our beaches guide for locations). According to the National Trust, Culver Down near Bembridge is the best place for kite flying. They do offer the wise advice to 'Keep away from cliff edges or cars' (I'd be more worried about the former, as I do tend to walk backwards when kite flying). A Red Funnel guide recommended Chillerton Down which is more central. It does have a massive great mast though... Tennyson Down near The Needles is another option (again, try to avoid running off the cliff whilst enthusiastically trying to launch your kite). There's no point asking most children to 'admire the view' - I used to just grunt and refuse to look up from my Gameboy. However, if you are a little more mature then you might like to consider stopping off and admiring the (free) view from some of the best car park viewpoints on the Isle of Wight. Brighstone is a very nice village in my view, and it is much less visited than biscuit-box favourites Godshill or Winkle Street in Calbourne. It has a pretty old church, several thatched cottages, a couple of places to eat and two busy little shops. Remarkably, it also has a museum, which volunteers have managed to sustain, presumably on a shoestring budget. Brighstone Museum is a thatched cottage with artifacts about village life. Former residents of Brighstone include fossil pioneer Rev William Fox, Samuel Wilberforce (son of William Wilberforce) and my mate Lee. Would you believe a payphone costs 60p nowadays? And by the time I finish this sentence it will probably be 70p. Back in the days when phoneboxes were more than just places to shelter from the wind, the UK was full of K1 phoneboxes. Bembridge has one of the last remaining ones and apparently the UK's oldest working phonebox (read the blog about our visit to the phonebox). Rylstone Gardens is a pretty little clifftop park in Shanklin which has Isle of Wight Council signs out the front (there's also a hotel in the grounds). There's a bandstand which hosts Sunday afternoon performances by well dressed tooters and parpers (by which I mean Brass Brands and the like), as well as plenty of pleasant flowers and trees to fall asleep under. The park links up with the clifftop park so you can walk down to the beach. If you are willing to stretch to a few pounds there is a cafe and crazy golf course (quite a basic one, but still a good lark - read our blog). We parked for free on Luccombe Road but there was also some free parking on Popham Road. Rylstone Gardens' postcode is PO37 6RG. Thanks to Victoria for getting in touch and recommending Geocaching as a free thing to do on the Isle of Wight (or anywhere for that matter) if you have a smartphone. Geocaching is a bit like a treasure hunt, although the treasure isn’t quite as exciting as a big wooden chest full of gold – it tends to be things like plastic Kinder Surprise toys. Download a free android app called Geocaching Intro (Apple fanboys can get the same thing on the App Store). There is a paid version (£7.99 on Android at the time of writing) which has a few more features but the free version was enough for me. Turn on your phone’s GPS and it will tell you roughly where people have hidden little boxes all over the Isle of Wight. They are generally somewhere public and often tie in with local history or landmarks. Find the little box and then write your name in the logbook. Some boxes have little toys and trinkets which you can swap for something of your own. Read about our first Isle of Wight geocaching adventure. 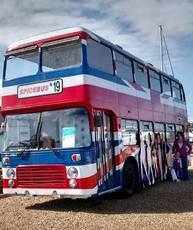 Fans of critically condemned 1990s pop-based cinema will undoubtedly get a thrill from seeing the original Spicebus which appeared in Spiceworld: The Movie. For a long time it was on show at Island Harbour. When I checked again in 2018, it was doing a tour on the mainland as part of a restoration fundraiser, but I'm hoping it will return south eventually. Isle of Wight Pearl attracts big crowds of people and seems to have more coaches visiting than Wembley Stadium. You can hear a talk about pearls, buy a necklace or some other pearly thing and then have a cream tea. It is on the very attractive Military Road and it is free. If you'd like to admire Britain's victorious military past whilst sat on a children's roundabout then consider Puckpool Park (PO34 5AR) near Ryde. There's the remains of Puckpool military battery with nice views towards Portsmouth as well as a pretty decent medium-sized playground for toddlers (and probably junior school aged children and a couple of dads who should know better), tennis courts, mini golf and somewhere to get something to eat. Puckpool Park also hosts slightly random zombie themed events called Park of the Dead. 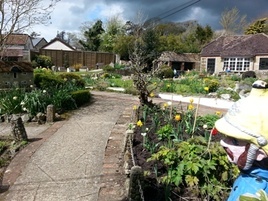 It's only a 15-minute attraction, but if you're in Godshill have a wander through the Old Smithy Gardens which are very well kept and full of chintzy things to amuse little ones and pretty flowers to amuse older ones. Please exit through the giftshop. If you're visiting the Isle of Wight with toddlers or teenagers ​then I'd say your chances of a successful birdwatching outing are slight at best. However, if you are grown-ups who have been allowed out on your own then there are several good birdwatching spots on the Isle of Wight. The National Trust has hides at Newtown Estuary which is a suitably isolated and sleepy part of the Isle of Wight. It also recommends St Helen's Duver, Tennyson Down (West Wight), Headon Warren (near The Needles), Mottistone Common (West Wight) and Borthwood Copse (near Sandown). 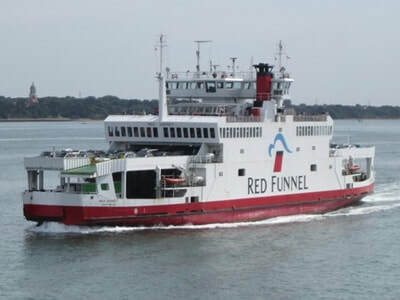 A useful Red Funnel birdwatching guide also recommends marshes between Bembridge and Brading (there's a RSPB site at Brading Marsh), the West Yar Estuary (Yarmouth), The Medina Estuary and The Needles if you fancy seeing some 'raptor species'. I thought that was a type of dinosaur, but I'm not a bird expert. Personally I'd start with Newtown Estuary (postcode PO30 4PA), but I'm ready to be corrected by a twitcher. Now...this isn't a great day out for the kids but when I was a student I thoroughly enjoyed sitting in on the occasional Crown Court case to get a sense of how our justice system works. It's worth reading up on visiting and checking with the local court to make sure you don't break any rules. Newport is the location for the Island's legal cases. Roll up, roll up for the Isle of Wight movie locations tour, which involves driving around the Isle of Wight and saying "was that beach in that film with you know who?" We've compiled a list of 10 films and TV programmes starring the Isle of Wight, so you can tour around. It's a bit like those tours you get in Los Angeles, just a lot cheaper, and shorter, and less impressive. I won't list every single walk on the Isle of Wight (since there are rather a lot), but this quirky one appeals to the schoolboy in me. The Ventnor Enhancement Fund has created a scale model of the solar system along the seawall between Bonchurch and Ventnor, along with information boards about each planet. The model of the Sun is in Bonchurch and you'll reach Pluto after about 1000 paces. I've included Tesco Clubcard Days Out as a 'free day out' as there are various tricks to accumulate Clubcard points, although I admit they usually involve a lot of effort. 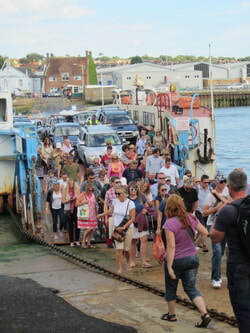 The short chain ferry crossing/floating bridge between (West) Cowes and East Cowes used to be free for foot passengers but after protests, consultations, and a lot of sarcastic eyebrow raising there is a now a charge...of £1 for a return journey. They've also had problems with the running of the new floating bridge which has only made the tutting louder. And then there was a petition to call it Floaty McFloatface. If you manage get to Cowes, then it is nice for a wander round, particularly during Cowes Week when there are usually a few freebies being given out on the Esplanade. East Cowes has a few shops, a playground on the Esplanade and a Waitrose.